Why are you using 50 ohm coax on your scanner? Since no scanner ever manufactured transmits RF, why isn't everyone using the Bell Laboratories proven best feed line for receivers? Because people are allowed to make their own decisions.That being said I use both. Because for the last 60yrs or more most radios and antennas for communications are 50 ohm and that's what you use unless you want VSWR problems. Using 75 ohm coax with modern scanners and antennas is the compromise. Because if you decide to use the same cable run in the future for a transmitting radio, you don't have to replace the cable. Pretty much just to piss off people on the internet. RG-6 will work great on your scanner, go for it. Your match will be off, but not by much. It's no different than when you have a higher match with a 50 ohm system. If the match is let's say 2 to 1 using 50 ohm coax, it means your antenna is not a 50 ohm load to the radio, it's out of resonance. Using 75 ohm coax and adjusting the antenna to match is no different that trimming an out of resonance antenna using 50 ohm feedline. There's nothing wrong with using 75 ohm for radio if you can get a good deal on some high quality stuff. IMHO part of the problem is the need for smaller and more flexible cables - a 75ohm cable with the same external diameter as a bit of RG58 has a quite small centre conductor and if you want it stranded to be flexible then each individual strand is getting very small. I have no problem with RG6 and LMR400 for receiving all frequencies from LF to UHF but I haven't transmitted through them. I still have some RG8 when the time comes! Its much more complicated than that and can result in noticeable loss in many cases. Besides the calculated loss using a 50 ohm matched antenna and radio designed for 50 ohms with a 75 ohm feed line, depending on the length of the 75 ohm feed line it can turn into a matching transformer to some other odd impedance with additional losses. Why? Because 50 ohm became the de facto standard for any type of RF communications, which included not just transceivers, but also receivers/scanners. When was the last time you saw an F female connector on a scanner or high quality RF antenna? Right, so because basically every scanner manufactured over the past few decades features either BNC or SMA, and high quality RF antennas feature N connectors...the logical choice is to stick with 50 ohm cables and connectors that are readily available. Same with devices like pre-amps and multi-couplers, which could probably be special ordered with F connectors, but why bother with the hassle? See, when you start to add up the insertion loss of the F to BNC/SMA/UHF/N adapters you need with 75 ohm coax, that "superior loss spec" of 75 ohm starts to melt away. And of course the length of the run has a lot to do with exactly how much that loss equates to in the first place. It may be so negligible that it's simply not worth the effort trying to adapt coax to squeak out maybe 0.5 dB extra. So instead of getting dazzled by those "superior loss specs" of 75 ohm coax, only to cripple it with junky eBay adapters on both ends of the cable...stick with some good LMR400 with quality, native 50 ohm connectors, a proper high quality antenna with an N connector, and call it a day. 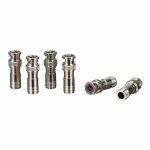 You can use high-quality BNC compression connectors designed for 75-ohm RG6 or RG6 Quad Shield coax. That would eliminate the need for any F-to-BNC adapters. Sure, of course you can, as well as good quality F compression connectors. But for the average Joe who doesn't want to spend money on the compression tool, he's going to simply buy some adapters from China. And while that solves the scanner end of things with a BNC, anyone with an SMA connector still requires an adapter, as well as UHF/N connector on the antennas side needs adapting. Since when does a scanner create standing waves? The RF port at a scanner couldn't care less (within reason) what impedance your coax is at. I've always used 75 ohm for RX stuff because it's cheap, plentiful, and works perfect. Compression RG-6 BNC are your best friend.